Trust me when I say, this palette is worth its weight in gold! 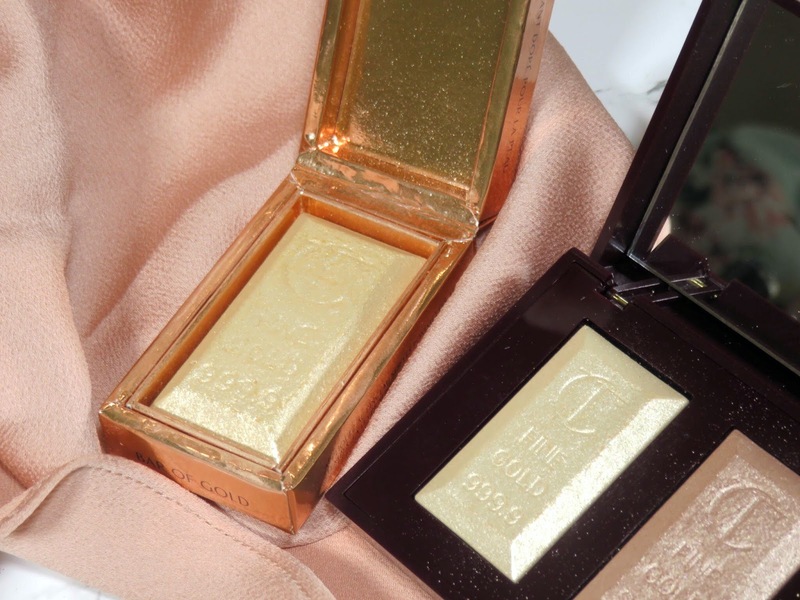 The extremely popular and coveted gold bar highlighter, has been an item that has been sold out over and over again. I bought mine several years ago and it has been very well-loved, even in my humongous highlighter collection. 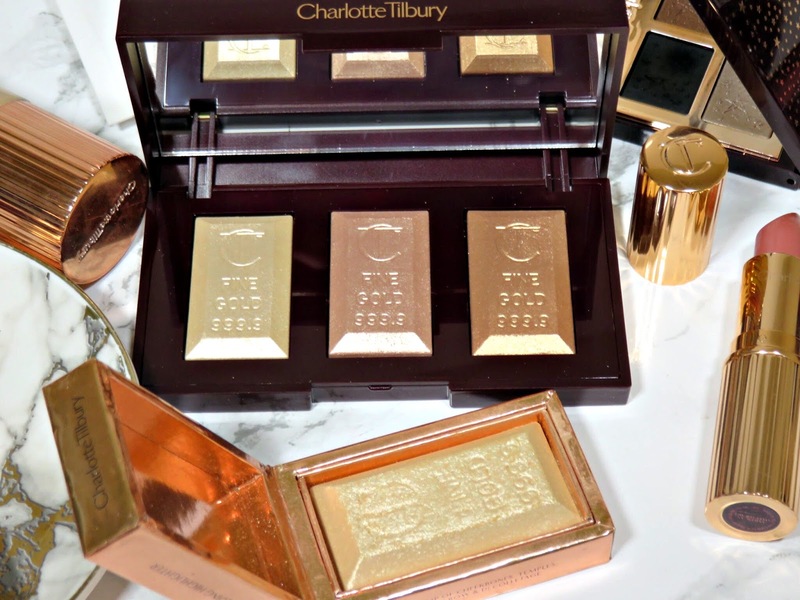 Charlotte, being the entrepreneur she is, decided it was time to a release a palette with three different gold bar shades and it doesn't disappoint! 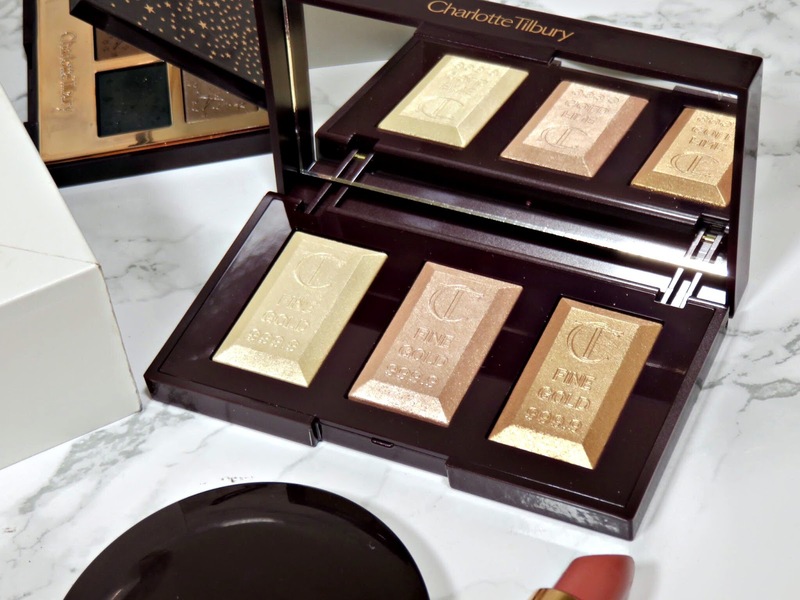 The Charlotte Tilbury Bar of Gold Palette retails for $58.00 USD and is available at Charlotte Tilbury. 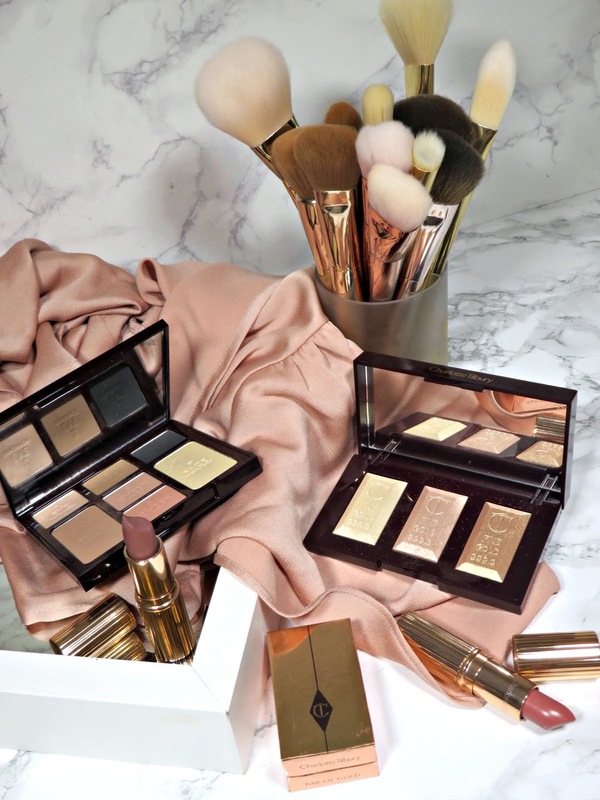 As I have mentioned before in previous reviews, I love shopping on Charlotte Tilbury's website because they have amazing customer service, they ship quickly, and shipping is free! I can't recommend their site enough! I was honestly trying to resist this palette, since I had already gone quite highlighter crazy the past few months but the words "limited edition" got me... and soon enough I was checking it out of my cart. 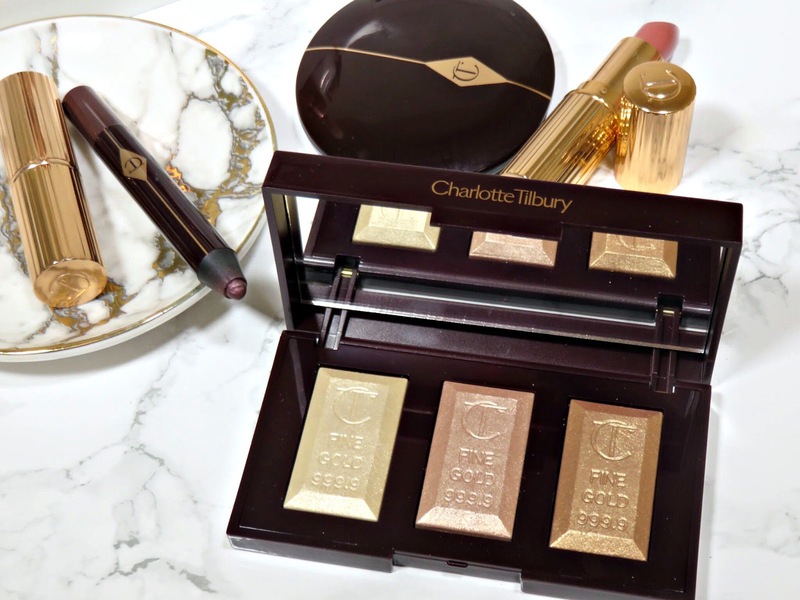 The palette is housed in Charlotte's classic burgundy and rose gold packaging and is surprisingly a much smaller compact than I expected. The compact snaps closed and has a nice sized mirror inside. The packaging is very light and made of plastic but still feels sturdy and durable. 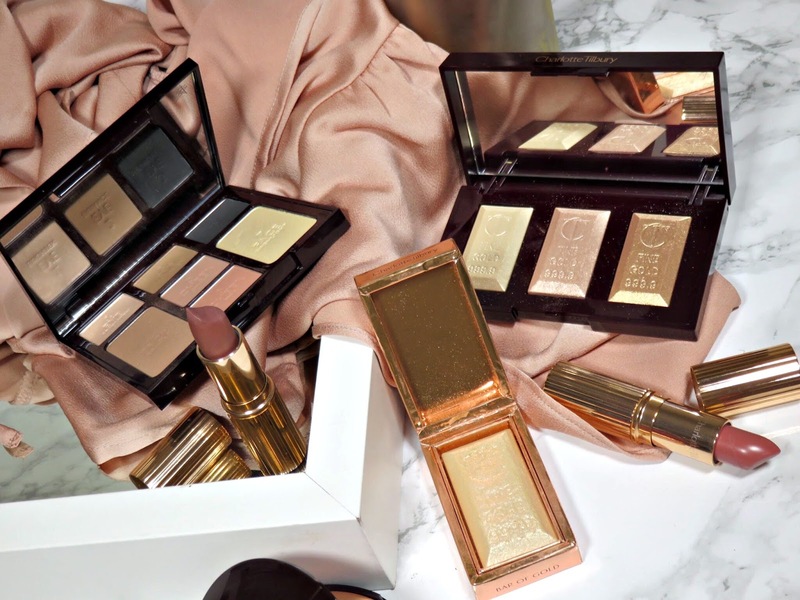 The palette contains three highlighter shades The Original Gold, Rose Gold, and Gold Bullion. 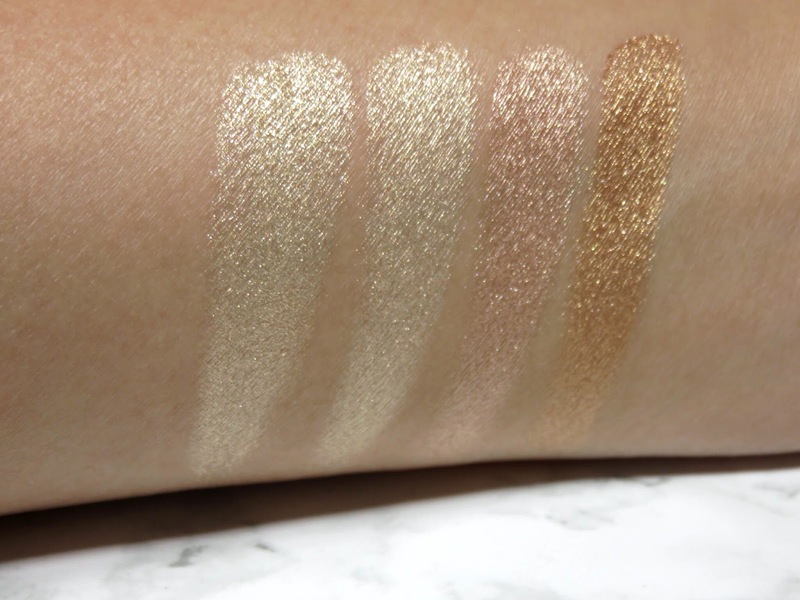 The Orignal Gold - This is a soft gold shade that will compliment just about any skin tone! 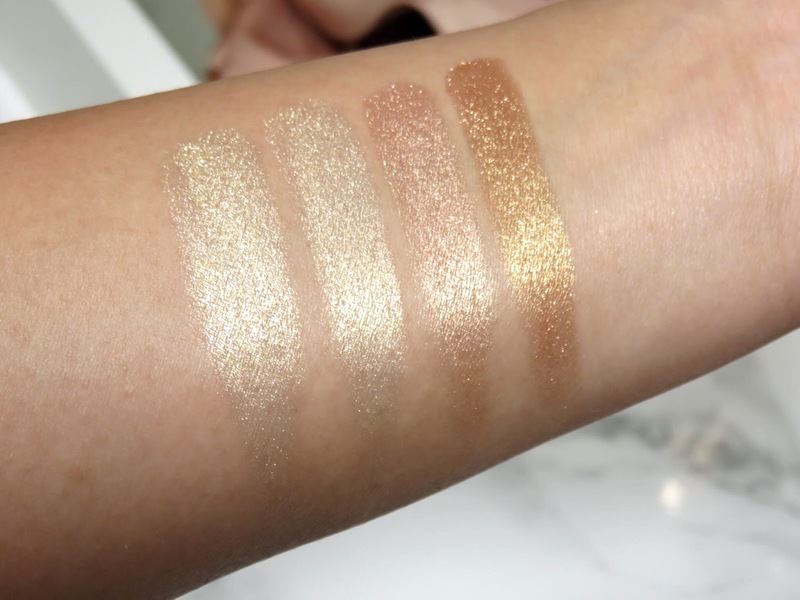 I am always wary about gold highlighter because I don't like when they are too golden, on my medium skin tone it looks like I'm wearing gold eyeshadow on my cheeks and I'm not a fan of that look. This is the perfect amount of soft gold and champagne to give you that golden goddess kind of look. Rose Gold - This shade embodies its name very well. It is a soft rose shade with a bit of soft gold intermingled into it. The rose shade does not lean too cool, the soft gold inside makes it wearable for all skin tones. On the skin, it is remind me more of a champagne shade with a hint of rose. I think it will be very universally flattering and the more subtle of the shades in this palette. 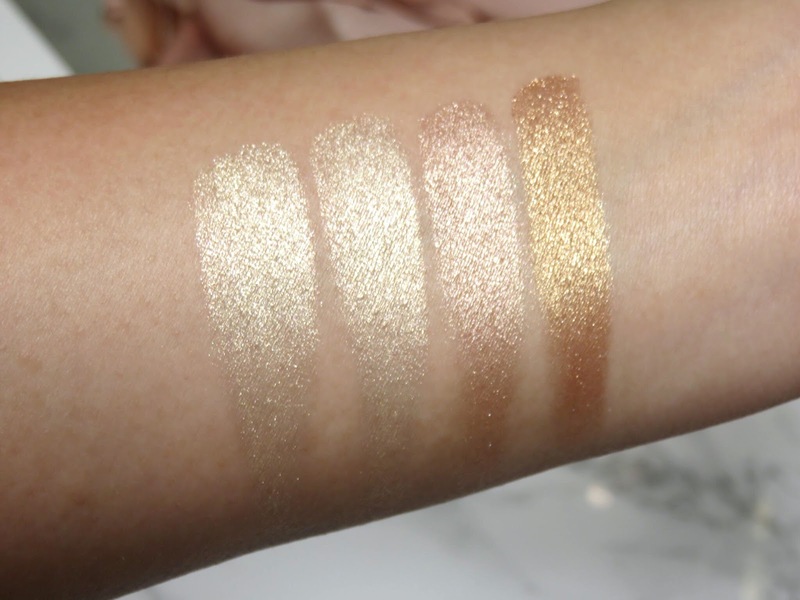 Gold Bullion - This is a very warm and coppery highlighter shade. It has a very amber tone to it and will compliment tan to deeper skin tones. 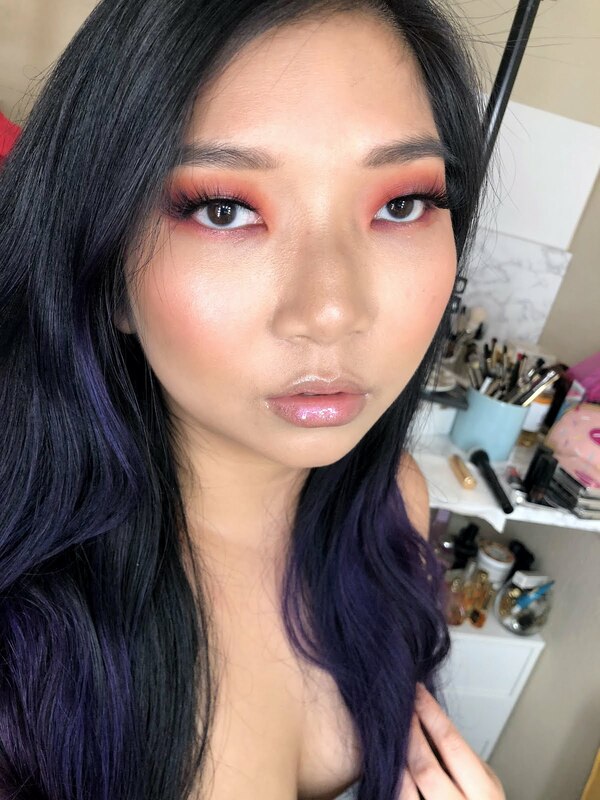 On fair to medium skin tones, it will work very well as a blush or blush topper shade and it makes a stunning eyeshadow color! I would consider my skin to be a medium tone, I'm not tan at the moment, and when I applied this as a highlighter and buffed it out it looked beautiful. It looked like a warmer version of the original gold bar shade! This formula is exceptional! Which is why the original is so highly coveted! This is a baked formula that is extremely finely milled and pigmented. It offers an subtle to intense gleam to the skin, depending on your application method. I love how buildable the product is and how the reflect is so soft. 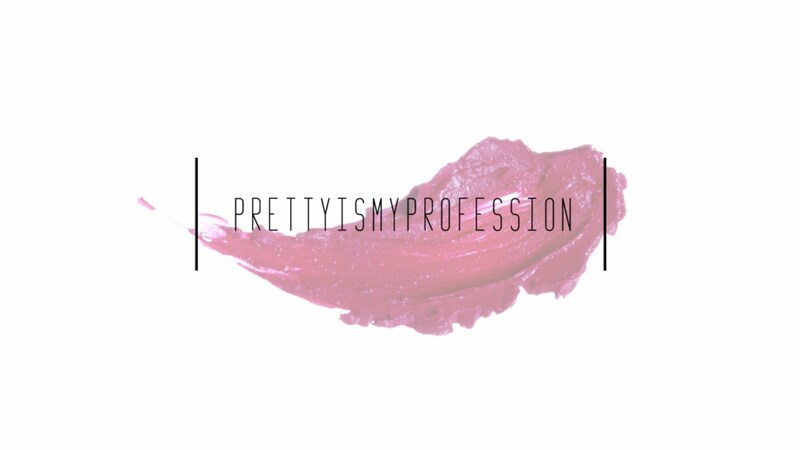 The product is not shimmery or has sparkly chunks but it is very smooth and gives off the perfect reflect. It sits on the skin beautifully and doesn't emphasize texture or pores. It gives your skin this super fresh and natural glow to your skin. This palette is actually created with a new and improved formula, which isn't significantly different from the old one. However, I do notice that the texture seems even smoother and more finely milled than before. The way it sits on the skin, it offers a very even and smooth highlight. You don't see where the glow begins or ends because it blends so well into the skin. While the old one did have a smooth and fine texture, it doesn't look as seamless as this new formulation. 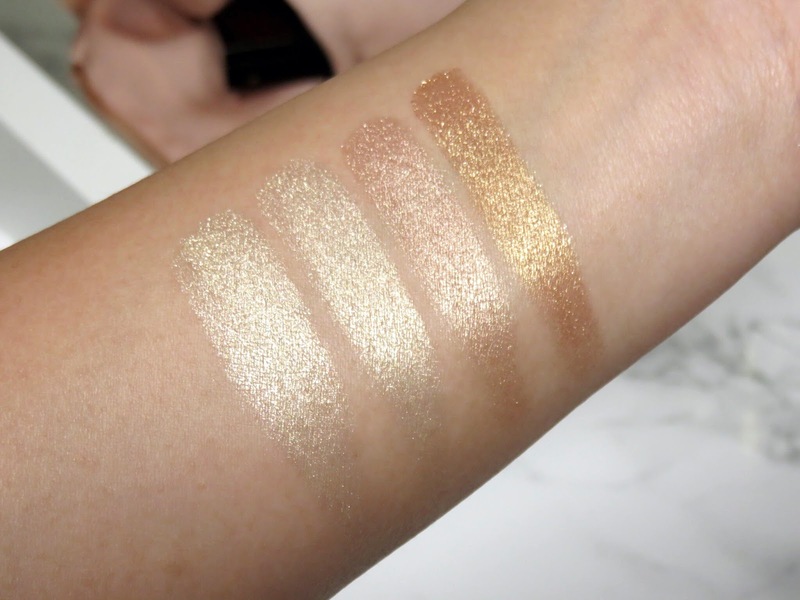 You can see the highlighter and the texture more on the skin with the old formulation.The color looks pretty much the same as well, it's just the formula that is easier to use and looks more seamless. This new formula offers an almost glossy shine to the cheekbones, as opposed to a shimmer finish. I love the new color options this product has to offer, however I think the Original Bar of Gold shade is still the most universal shade! 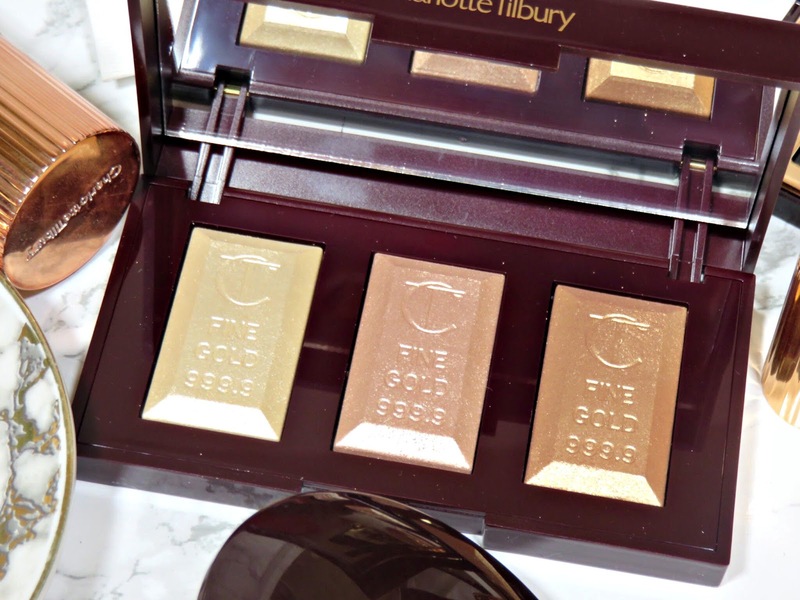 Charlotte Tilbury has many videos of her using this palette all over on her models, on the eyes and face to create the ultimate glow. I think this is a fun way to use this palette for other than highlighting the face. I would highly recommend picking this palette up, especially if you don't own the original Bar of Gold! This formula is much creamier and smoother and it will work well on all skin types, even those who are more mature. I think the shades are very sophisticated and the formula is modern. Seeing as how I've made a huge dent in the first one, I expect to be using this palette quite frequently. All the shades work so well for all skin tones and will compliment any look you do!